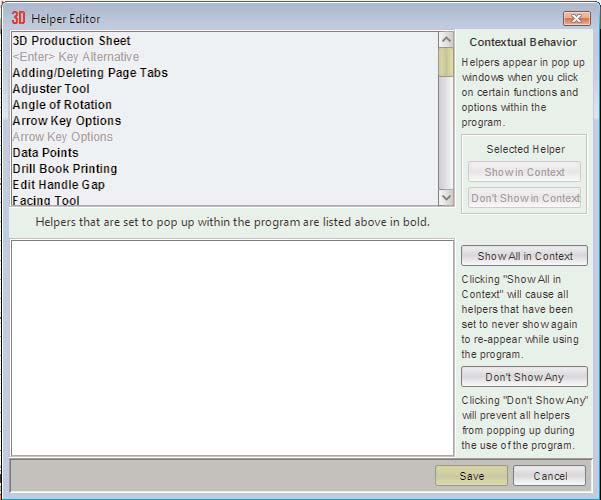 The Helper Editor allows you to turn on or off specific helpers and allows you to view all helpers at one time. Show in Context turns the selected helper on to be seen when its tool or function is activated. Don’t Show in Context turns the selected helper off, and will not be shown when its tool or function is activated. Show all in Context turns all helpers on to be seen when their tool or function is activated. Don’t Show Any turns off all helpers, and will not show when its tool or function is activated.